It’s time for the next round of Bout of Books, one of my favorite readathons! I love this one, because it’s a week long and very low pressure–there aren’t any constraints or instructions about what to read or for how long, you just try to read as much as you can over the course of that one week. In the past it’s tended to be a pretty successful readathon for me; even if I don’t read a crazy amount, I generally read much more than I would in a typical week thanks to the extra motivation. Bout of Books takes place from Monday the 20th through Sunday the 26th, which looks like it’s shaping up to be a pretty typical week for me; I’m working during the week, and will be celebrating a friend’s birthday during the weekend, but I’m not going anywhere or doing anything crazy. Since it’s still summer, I’m hoping to take advantage of the nicer weather and do some outdoor reading. So, what am I planning on reading? I tried to be strategic with my TBR; I wanted to have a good amount of variety and also choose books that fit into my typical readathon wheelhouse while not neglecting my overall TBR for the month of August. On that note, I’ve unfortunately barely started Circe by Madeline Miller, which was my top-voted pick for the Make Me Read It challenge over on Litsy, and which I absolutely have to finish by the end of the month. If I could get through a chunk of it during the readathon, that would be fantastic–it’s a book that I really think that I’m going to love, but I just haven’t been in the right mood for it yet. Since shorter works are great for readathons, I’m looking forward to picking up The Only Harmless Great Thing by Brooke Bolander, which is a Tor.com novella that somehow connects the radium girls and the death of an elephant in the early 1900s. I’m generally a fan of Tor.com novellas, so this might be the first book I pick up for the readathon. I also set aside a short story collection, Dreadful Young Ladies and Other Stories by Kelly Barnhill, that I’d like to at least start reading during the week. It’s been awhile since I’ve read a short story collection (and the last two I read were disappointing) but I do think that it will help to mix things up during the readathon. Another readathon standby for me tends to be YA, so I set aside two YA options that I think I’ll be in the mood for this week–The Rules and Regulations for Mediating Myths and Magic by F.T. Lukens and To All the Boys I’ve Loved Before by Jenny Han (because I just watched the movie, which was so adorable I immediately had to get the book). I also threw in a contemporary romance that I’ve heard good things about (The King of Bourbon Street by Thea DeSalle) and a new fantasy that I picked up last month (The Mermaid by Christina Henry) for some more options, and of course I always like to have an audiobook option–this time it’s No Time To Spare by Ursula K. Le Guin. There’s no way I’ll read all of these books in a week, but I think I have some solid choices, and I’m definitely excited to be diving into another readathon–even if I end up ignoring my TBR and mood-reading my way through the week. 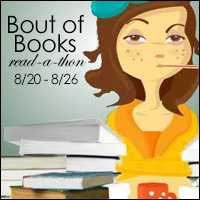 Are you participating in Bout of Books? Let me know! So many exciting books, best of luck! I’m also joining in but I hope to only read at least two books throughout the week, but I also have a lot of choices for the books I’ll be reading this readathon.